Enlarged Prostate Messing with your Golf Game? Have you, or someone you know found yourself out on the golf course needing the use the restroom, right in the middle of your game? This is a common occurrence, out on the links. Especially among men who experience symptoms of an enlarged prostate. Even in younger men, who are just trying to stay hydrated. Whether, your choice of beverage is water, sports drinks or beer…at some point, you’re going to have to get to the restroom, to relieve yourself! Unfortunately, the bathrooms on a golf course aren’t so conveniently located. You should be concentrating on how far your ball is from the pin not how far is it to the next bathroom! Many men, embarrassingly, are forced to duck behind a tree or shrub. However, more and more golf courses are handing out fines if your caught emptying your bladder in this open public manner. So what is the solution? This is where the UroClub comes to the rescue. The Uro Club is a portable urinal designed to look like a golf club. It goes in your golf bag with your other clubs, but cleverly designed to look like a 7 iron. The top of the club is a hollow reservoir that holds about 500 ml. That’s almost 17 ounces. The club was the idea of a Board Certified Urologist who saw a need after hearing stories like this, from his patients, and seeing men relieving themselves on golf courses where he played. At one time or another, this must be happening on every course in the world. That’s why the Uro Club was developed. As men get older the prostate enlarges. It goes by several names; enlarged prostate, BPH, or benign prostate hyperplasia. What happens when the prostate enlarges is the prostate cells multiple, and that puts pressure on the urethra. If the urethra begins to narrow the bladder needs to contract more to force the urine out of the body. This can cause the bladder muscles to become stronger and overly sensitive. Creating the feeling that even when there is a small amount of urine in the bladder it creates the need to. Many people do not understand what an enlarged prostate means, and how it can cause urinary incontinence. You can find out more information on WebMD about an enlarged prostate. 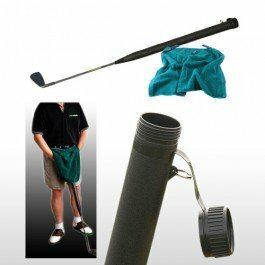 The UroClub is a convenience item for some who just want to avoid urinating in public on the golf course. But for some men with a prostate problem, who just want to play a round of golf and not have to worry about running back to the club house to use the restroom, it is just what they have needed. No one wants to see men standing off to the side of the fairway or green urinating. This just allows a little more discreetness and dignity for those who respect the club rules. After all from a distance it appears that you are just practicing for your next shot. The next time you see someone with a towel on their waist while they are lining up their next shot give them some courtesy. They used to be like you when they were younger.